The oldest independently owned restaurant still operating in Arizona! One of the states great wonders! We use the best ingredients in all of our dishes! Like this yummy bowl of 2 Gun Chili. There’s a reason why we sell more pie than any other single location in AZ. Come in for a slice or order online! Where history and great food meet. Established in 1918, Rock Springs is a historical landmark serving legendary pies and great atmosphere! 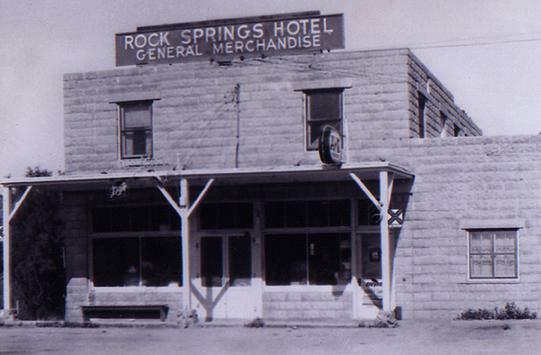 Rock Springs began from an early Indian Encampment, an early Cavalry Bivoauac and a watering hole for miners, cattle drives and sheepherders during the expansion of American West territory from 1860 until 1917. The first commercial development began in 1918 by young Ben Warner who built a canvas-covered store while making the adobe blocks for the restaurant, general store and hotel which was completed in 1924. Ben hauled in gasoline in 5 gallon cans to sell; and canvass water bags that could be filled from his hand-dug well. The Rock had the first & only telephone (No 93 assigned in 1922) for many years and also served as the local post office until 1955 when Ben Warner as its postmaster. The 1878 early Patterson & Caldwell stage line ran stagecoaches from Phoenix to Prescott on the road that can still be seen behind the Café crossing the Agua Fria creek bordering our Spring Garden Patio and natural spring well. Award winning meals, unforgettable atmosphere!